The water bottle for dogs on the go. Just squeeze and it fills from the bottom of the bowl. 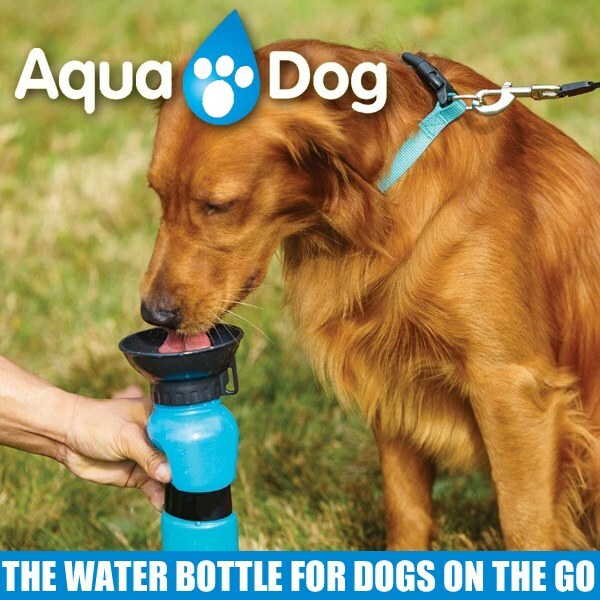 Aqua Dog the water bottle for dogs on the go. As seen on TV Aqua Dog is the portable water mug. Simply fill the Aqua Dog container before your trip. When your dog is thirsty, squeeze to fill the attached bowl and watch as he easily drinks! No mess, no spills! The belt loop attachment makes the Aqua Dog mug great for hikes, walks or road trips. Fits easily in most car cup holder. Holds 18 ounces of water. The attached bowl is specially designed to fit all dogs. Plastic. Hand wash. Aqua Dog lets you easily keep your pet hydrated. Great for dogs of all ages and sizes. Our pet used the product right away. Sometimes wary of new toys and objects this worked great. We will keep it with us in the car now wherever we go. Just used this at our dog park yesterday. My dogs used it without thinking and drank readily. They would previously look at their water bowl and walk away. I think we&apos;ve got a keeper here! Just received so no opportunity to use yet. Should be very good. My dog loves it! It really comes in handy when we go out anywhere. Bought 2, and they are great when taking dogs for a walk.